Rides at the State Fair undergo state inspections each year. So do ski lifts, elevators and moving walkways at the airport. But zip lines and ropes courses don’t get the same treatment….In North Carolina, inspections are self-regulated by the aerial adventure industry. 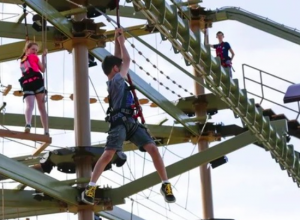 In July 2018, a “new ropes course at [a lodge]” was temporarily closed “after a child fell,” according to Ozarks First. The young victim was transported to the hospital in “stable” condition. Adventure course patrons have a right to be safe and secure while enjoying the property. By law, adventure course owners have a duty to protect patrons from any foreseeable harm. This responsibility is particularly critical when overseeing the safety of children. Should an adventure course property owner fail to implement proper security precautions, safety training, or equipment inspections, they may be held civilly liable for any injuries or deaths which occur as a consequence. We’ve Recovered Millions for Victims of Property Safety Negligence…Contact us Now for a Free Consultation. The Murray Law Firm has an extensive and successful record representing victims of property safety and security negligence. We have recovered millions of dollars for our Clients, and we recently obtained a $29.25 million dollar verdict for a victim of an unsafe property. We offer our legal assistance, if desired.